Question: What is the difference between a glycerin-filled pressure gage, and the dry version? 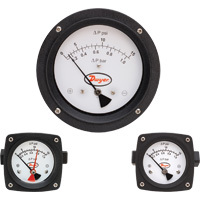 Answer: While dry pressure gages are the most commonly used gage, they do have some drawbacks. 1. The dial may become obstructed by moisture build up in the gage. 2. Temperature drops may cause unrepairable damage to the sensor’s diaphragm, bellow, Bourdon tube, or pistons. 3. Surges of pressure may be more likely to instantaneously burst the gage. So, how does a glycerin-filled gage work differently? A glycerin-filled gage will do the same work as a dry gage; however, the precision is normally greater. Glycerin-filled gages are available in the same ranges, or sometimes larger ranges, as their dry counterparts. 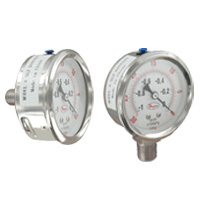 These gages feature a scale and face connected with glycerin, resulting in reduced visibility issues in humid conditions and protection from pulsations and pressure spikes within a system. The fluid also mitigates the effects of vibrations and internal friction of moving parts. Glycerin will help prevent internal corrosion of the device by acting as a gate to keep moisture and other substances out. Dwyer offers several glycerin-filled gage models, including the: 2.5″ 316 SS Industrial Pressure Gage, Series SGZ; 2.5″ Brass Industrial Pressure Gage, Series SGY; Differential Pressure Piston-Type Gage, Series PTGD; and Process Gage with Dampened Movement, Series 765. Previous PostPrevious Ask the Expert: How should I decide which flow meter would be best for my application?